GiftBasketsPlus.com is pushing the gift-giving envelope again through its new line of personalized gift products. GiftBasketsPlus.com has recently added significant capacity for developing and fulfilling a broad range of customizable and personalized gifts. GiftBasketsPlus.com is pushing the gift-giving envelope again through its new line of personalized gift products. GiftBasketsPlus.com has recently added significant capacity for developing and fulfilling a broad range of customizable and personalized gifts. This expansion goes beyond the normal name and message personalization; GiftBasketsPlus now offers the ability to wholly customize themes for each gift. There are now more than 10 gift artists on staff who are dedicated to working with customers to create the perfectly personalized gift. GiftBasketsPlus.com focuses innovative energy on providing thematic and personalized gift baskets and other gifts. For GiftBasketsPlus.com thematic and personalized gifts are centered on the idea that gift givers want to find a gift that connects with the recipient in a personal and thus more meaningful way. Two categories that exemplify this approach are personalized children’s gifts and corporate gifts. With the addition of several gift artists, GiftBasketsPlus.com is now able to offer a unique level of customer service where artistically unique gifts are produced as per customer specifications. With personalized children’s gifts GiftBasketsPlus.com has created gift offerings that allow the giver to work with gift artists who develop themes and use names or personal characteristics to develop a unique gift that is meant for the specific recipient. With this offering GiftBasketsPlus.com has created a way to give wholly unique gifts that speak to the givers truest intentions through a truly personal offering. 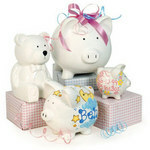 GiftBasketsPlus.com offers personalized piggy banks , personalized children’s furniture and a variety of other personalized gift options. “My friends and their daughter just loved the children’s table I purchased from GiftBasketsPlus.com. Emily, the daughter, considered it the best gift she received. Not only does she now have an arts and crafts table but one that is especially hers and painted with her favorite butterflies,” says Prudence Greenwood of Philadelphia. Business gifts are also an emerging field of innovation for GiftBasketsPlus.com. Many businesses feel the need to show their appreciation for clients and employees, both central to their success as a business. The holidays are an important time for this type of gift giving. GiftBasketsPlus.com has developed customizable corporate gift baskets that can suit a variety of gift giving needs allowing the gift giver wide latitude in the style, packaging and contents of their gifts. “When we received our gift baskets the whole office was in a tizzy. It really helped us to understand that we where an important part of the organization and that our hard work for the year was appreciated,” said Janice Lenz, director of marketing for a growing beverage company. It is these types of customer responses that drive the innovation at GiftBasketsPlus.com as the company looks to expand its gift offerings. The company plans to continue developing its unique gift offerings, working with its staff of gift artists to bring new and innovative gift concepts to market. Unique baby gifts and corporate holiday gifts will be expanded and new avenues for unique and personalized gifts will be developed. GiftBasketsPlus.com started as a local gift basket company in Philadelphia almost 20 years ago. With the popularization of online shopping the company has continued to expand its gift ideas to larger markets. GiftBasketsPlus.com is pushing gift innovation by offering unique and personalized gifts to the growing market of gift buyers who demand something special. GiftBasketsPlus.com offers this pig themed selection.